We visited the night bazar on our own, to have dinner and enjoy the cooler evening weather. 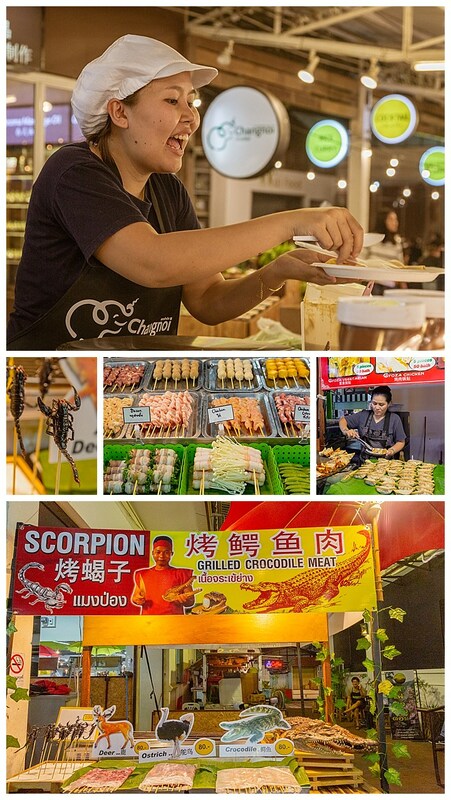 This market included a vendor selling crocodile meat on a stick (bottom), which became part of our meal. Does it taste like chicken? Well… yes and no. It is more of a cross between chicken and pork, and a bit chewy. I rather liked it, and will probably have it again the next time the opportunity arises. 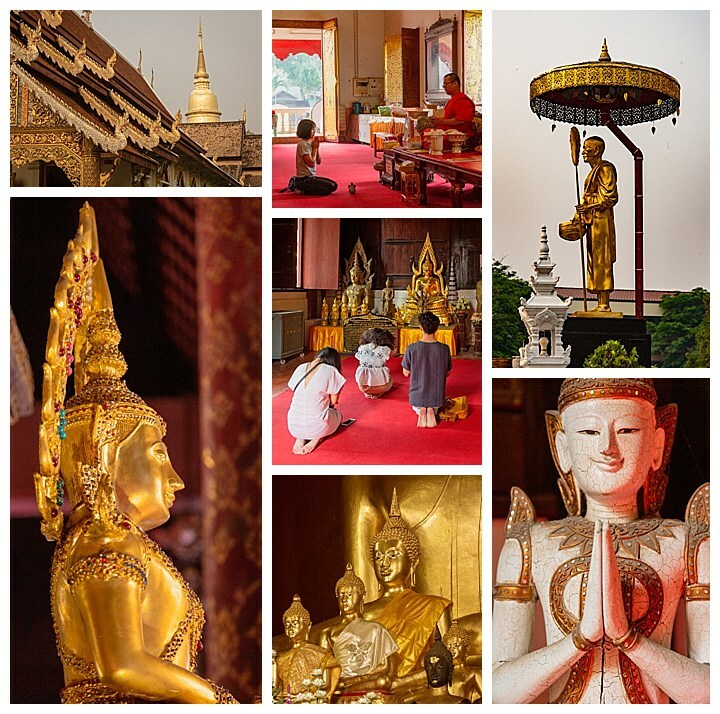 As in every other city and village we have visited on this trip, temples with Buddha statues abound, often made of a golden color (gold leaf). However, they come in all shapes and materials. 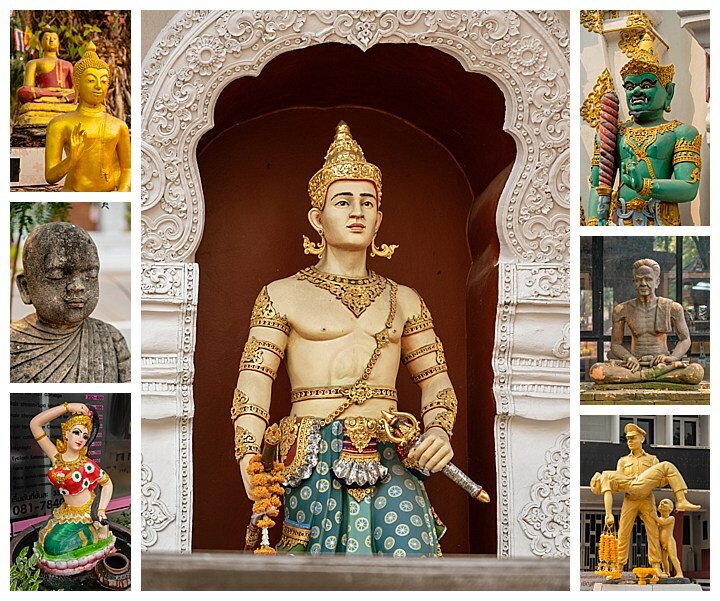 Though many of the statues here were religious, there were also others in evidence. The statue of the officer carrying a fallen mother was in front of the police station (lower-right). Some were even whimsical, as with the porcelain dancer (lower-left). 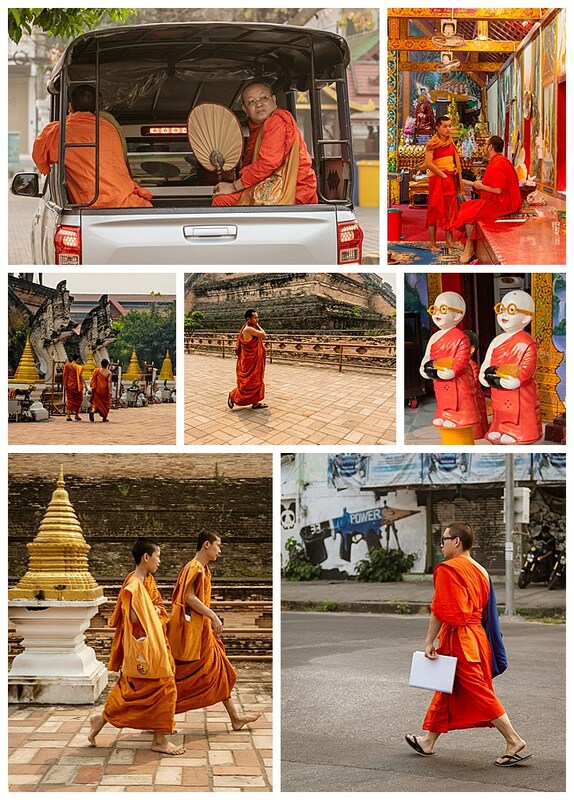 Monks in Chiang Mai were usually found singly or in pairs, going about their every-day life. There was one character often repeated as ceramic statues though — the little smiling boy monk wearing glasses, as seen center-right. 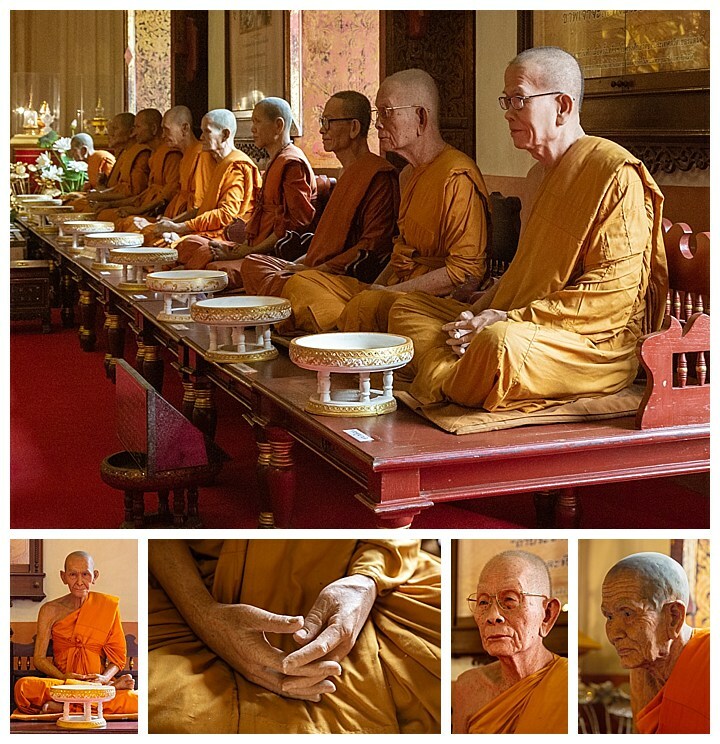 Some monks appeared in absolute stationary meditation poses. As we moved ever closer to photograph details, we suddenly realized these were actually wax figures, done with such artistry that we saw others also fooled into thinking they were alive! 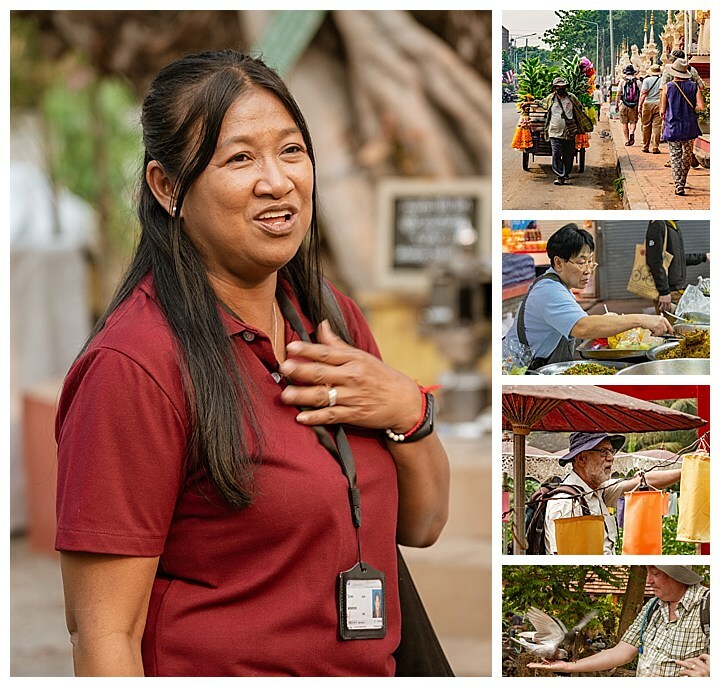 As we wandered around the streets, we saw many of the sights that had become normal during this trip. At one temple with a small lake on the grounds, there was a vendor selling food pellets to feed the koi. Steve, from our group, bought a small bag. He soon found himself swarmed by pigeons that wanted to steal the fish food, right from his hand (lower-right). As we go our separate ways, we want to again thank Wi (left) and her hard-working All Points East company for putting together this trip, for quickly responding when things did not work out as planned, and for always being cheerful, regardless of what was going on or the stress of getting everyone together at the right time and place.